The Sprint Wireless exclusive HTC Evo 4G LTE is the latest smartphone to come from the close and rather prolific collaboration between the carrier and the Taiwanese manufacturer. The handset is bound to take its spot as the flagship for Sprint's newly launched LTE network. 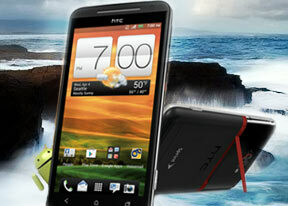 While its name might lead you to believe otherwise, the HTC Evo 4G LTE is rather closely related to the HTC One X for AT&T. It sports practically the same internals as its polycarbonate sibling, but with a few extra touches, which are bound to make a lot of HTC One X owners pretty jealous. The abovementioned extras include a microSD card slot, a dedicated camera button, as well as a metal kickstand, which harks back to the glory days of the original HTC Evo 4G. In short, the HTC Evo 4G LTE offers the same top of the line functionality, which we came to love in the HTC One X, while addressing most of its shortcoming. Here goes the full list of features, which the newcomer has to offer. On paper the HTC Evo 4G LTE is the best equipped smartphone to hit the US market so far this year. The handset simply packs everything an Android junkie can possibly demand, wrapped up in solidly built, good looking package. In fact, we really can't help but wonder why arguably the best smartphone that HTC currently has to offer is available exclusively from the third largest carrier in the United States. As thing stand now, it might actually be a while before you get to enjoy Sprint's LTE network in your area - it is still in early stages of rollout. The silver lining regarding this issue is that the HTC Evo 4G LTE showed a rather impressive battery life when connected to Sprint's 3G network. As for the small, glossy plastic cover on the back - it is a small price to pay for having a microSD card slot on board. As always, we are going to kick off the review with an unboxing, followed by a design and build quality inspection. Editorial: You might notice that this review is shorter than usual and doesn't include all of our proprietary tests. The reason is it has been prepared and written far away from our office and test lab. The HTC Evo 4G LTE is a US-only phone and it's unlikely it will be making rounds on the Old Continent. Still, we think we've captured the essence of the phone in the same precise, informative and detailed way that's become our trademark. Enjoy the good read! Htcsprintph441004g ????? support jio4g volte/lte network by Reliance jio-----mobile have operating options for CDMA/ GSM as well 3G. & 4G GlobalRoaming!!! How do I use subtitles on the video player for my EVO LTE?